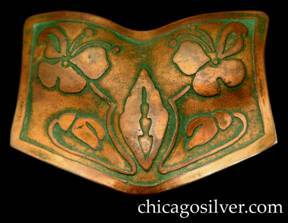 Most Arts & Crafts metalsmiths did not leave extensive archives. It is sometimes possible to find ledgers, drawings, templates, catalogs, correspondence, directories, exhibition listings, and tools, but these were often discarded or lost when companies shut down. 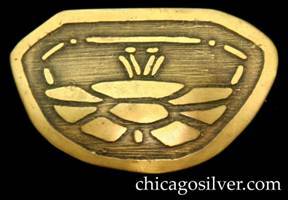 In Chicago, the Historical Society and the Art Institute have libraries containing some early metalcraft records. But a few makers are greater mysteries than others. Carence Crafters produced distinctive holloware and jewelry, but left virtually no published trail. The widely circulated letter below and a handful of other documents seem to be all that remain. Carence Crafters work is easily recognized, but is often confused with items from Frost, Forest Craft Guild, Marshall Field & Co. Craft Shop and a few other makers, including one that is definitely not Carence Crafters and that used back-to-back CC marks. The genuine Carence Crafters mark came in two forms. One was just two intertwined "C" letters in a small outlined box. The other used the words "Carence / Crafters / Chicago" next to this box. Lots of unsigned copper and brass items are attributed to Carence Crafters, but these were probably produced by other firms. 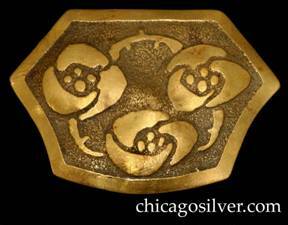 Carence Crafters used acid-etched geometric and nature designs (and on rare occasions lifelike tableaus), on copper, brass, German silver, and silver. 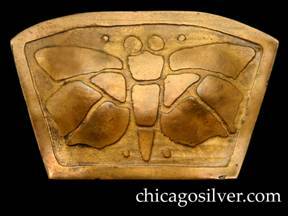 The most common forms are small trays, desk items, bookends, frames, and candleholders, but it did produce a fair amount of jewelry, often with stones, and almost always with trademark cutouts and intertwined (often asymmetric) versions of a Celtic knot. Generally, Carence Crafters did not employ heavy use of hammering at the edges the way Forest Craft did, or the lighter edge hammering used by Frost. The firm was probably in business for just a few years, and seems to have closed in 1911. 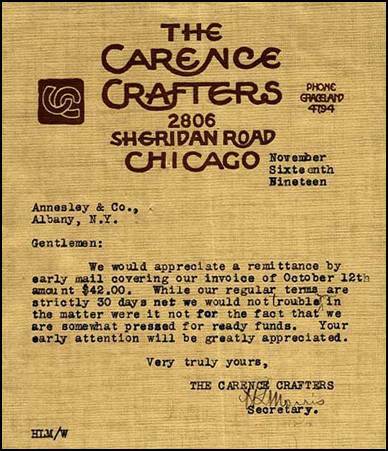 The Carence Crafters company was chartered by the State of Illinois on March 7, 1908. The principals in the company were R. D. Camp, C. D. Greene, and J. H. Dunham. Sixty shares were issued at one hundred dollars each. Dunham held 39 of them, Greene 20, and Camp just one. Camp was the president. His address was given as 449 E. North Avenue, Chicago. Dunham, the secretary, gave his address as the Hyde Park Hotel in Chicago; and Greene, treasurer, listed his simply as Evanston, Ill. The business address was listed as 170 E. Madison Street. In January 1910, documents were filed to increase the stock to a total of 240 shares at the same $100 value. The same officers’ names appear on the documents. In March 1911, paperwork was filed to cancel the charter of the company. The business address was given as 170 East Madison Street. The officers were now listed as R. D. Camp, H. L. Morris as secretary, and C. L. Lindsley as treasurer. 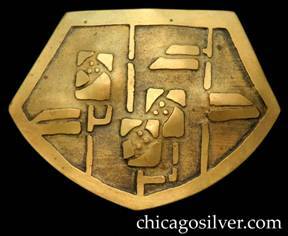 Fob, watch, shield-shaped acid-etched brass medallion on into rectangular folded-over leather strap with brass fittings, short chain, and clip to attach to watch. Leather in excellent condition. 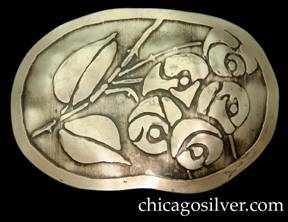 Hair clip or barrette, German silver, oval with squared off ends and acid-etched floral design. Double spring clip on back for holding hair. Set, stickpin and pair (2) of cufflinks. Silver-plated trapezoidal shapes with acid-etched abstract design. Repair to back of one cufflink. 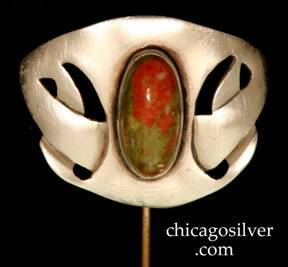 Hatpin, sterling, freeform rectangular with curving arms and cutouts on each side, centering a light green lozenge-shaped bezel-set cabochon stone. Pin broken off back. 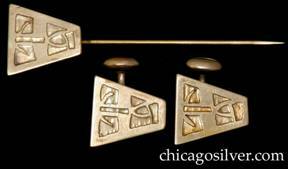 Stickpin, sterling, with star-shaped Celtic-knot type cutouts, centering irregular green-yellow-white bezel-set stone. Sliding safety.